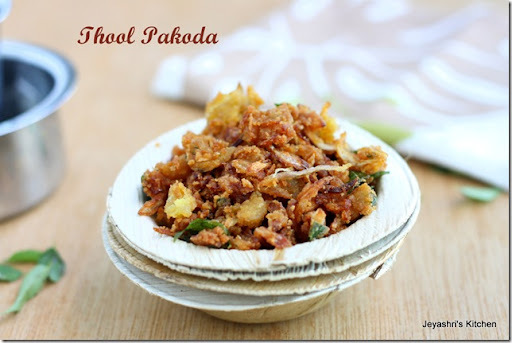 Thool pakoda recipe| Onion Pakoda,deep fried onion fritters, made using gram flour,rice flour and onions. It is a popular snack in my home town Madurai. My dad used to but this from a shop and we all love this very much. Among all,my grandmother is a huge fan of these thool pakodas and my athais too.I personally love to have this with curd rice more than as a tea time snack. Thool pakoda | Onion Pakoda,deep fried onion fritters, made using gram flour,rice flour and onions. Thinly slice the onions. Grate the ginger. In a wide bowl, add the rice flour and besan(gram flour). Using a mortar and pestle crush the green chilly. Add salt, sliced onions,grated ginger, crushed green chilly, curry leaves and coriander leaves( i didn’t add) and ghee|butter. Ghee/butter gives nice crispiness to the pakoda. Mix well. Keep it aside for 10 minutes. The water must have oozed out from the onion and normally that moisture is enough to bind the mixture. If needed add 1-2 tblsp of water. Heat the oil in a pan for deep frying. Sprinkle the mixture onto the oil and keep the flame medium. Take out from oil once it turns golden brown and the oil sound subsides. Drain in the kitchen towel and repeat for the rest of the mixture. Enjoy with hot filter coffee or tea. These pakoda will be very crispy even after 2-3 hours if you store in an airtight container. Adding ghee / melted butter gives crispiness to the pakoda. Crushed garlic pods can be added to get a garlic flavored thool pakoda. wowo..i just love this..especially goes well with some garam masala chai..drooling!! I love this gatti pakoda(wat we call)..but never heard of this combo wid curd rice. never had onion pakoda like this...looks so amazing. can have huge platefuls of this with hot coffee in the evening. Perfect recipe for this season. I too use rice and gram flour in equal quantity for making this recipe. so crisp. I make using the same method & proportions too and my husband is a big fan.. keeps asking me to make this. My daughter loves this, I can have this with thayir saadam also..
wow...this has been my fav since childhood days..love the flavour of the fried onions very much. u r tempting me to make some..yummm...love it. nice clicks. easy fata fat snack ,looks yumm and crispy! Love these crunchy, crispy pakodas, simply delicious! Yes that is very visible. Yummy recipe Jeya, luv it! Yes it will be thool only.